Christianity Oasis Ministry has provided you with this Hope Heals book with Hope Heals lesson. This Hope Heals book and Hope Heals study with Hope Heals truth looks into the Hope Heals message and asks what does Hope Heals mean, how Hope Heals, why Hope Heals, why Hope Heals is important, what is the Hope Heals message and how does the Hope Heals message affect you. Understanding the Hope Heals message is very important and knowing what the Hope Heals message means can help you to understand many things more clearly. Let us delve into this Hope Heals book with Hope Heals message and find what this author has to share on the subject of Hope Heals in this Hope Heals study, shall we? Run faster, got to run faster, got to hurry!! It’s coming closer! I can’t get away from it. I might as well just give up. I’m such a loser. I can’t do anything right. I should just end it all!!! Who said that? Where are those voices coming from? I’m so confused. I hear a voice agreeing with me, but then I hear another voice saying I’m beautiful? I don’t know what to believe anymore. Life hasn’t been good for a while. If there is hope, why haven’t I felt it before? Why now when I’ve decided life isn’t worth living, should I believe there is hope? Still small voice interrupts, “Lies, don’t listen to those lies. Please let me share the Truth of the matter with you. I love you. Yes I know it’s been awhile since you’ve heard anyone say that to you, and if they have it feels like just words, but I do truly love you. I love you so much that I’ve wanted to help you for a long time. The reason you haven’t been able to feel Hope before is because the darkness surrounding you has tried to keep you from me. But, I am stronger than the darkness. I want to be your friend. Be my friend? Someone wants to be my friend? Who are you? What do you want from me? Everything comes with a price these days, so what is it your looking for? And as far as love goes, well I stopped believing in love a long time ago. How can I believe that hope won’t cost a thing? What is Hope anyway? And besides….Yikes what’s that nipping at me again? Oh not the pain again…Pain so full of pain, my heart hurts from all the pain I’ve been going through lately. The only way out of this pain is to put an end to myself. Then the misery will be gone. Well if you are hope, then why weren’t you there when mom died? Why weren’t you there when my wife left? Why weren’t you there when I couldn’t find a job? Why weren’t you there when I cried until there were no more tears to cry? Why weren’t you there when the courts said I couldn’t see my kids? Why weren’t you there when my world started crumbling around me? Why are you here now, when I have nothing left?!! Darkness spews, “Are you really going to listen to all of that? I mean if He really cared about you, then you wouldn’t have lost everything! Go away! Just go away! You keep trying to get me to doubt this Hope but what you offer me is nothing but death. Hope is saying He wants to heal me. Hope is saying He will help me get past my past. No one has ever offered to do anything for me before. No one has cared before. It’s the only chance I have left…so Hope? Who are you? So, you’ve made the choice to come and find out who is Hope. I am so absolutely delighted! Who is Hope and what can Hope do for you? Well it’s all pretty simple but often seems more complicated. Hope is the Way the Truth and the Life. Hope wants to help you heal because Hope knows what you can truly be. Right now your sitting there so distraught with everything and thinking of how you can’t seem to succeed at anything. Maybe your finances are out of whack. Maybe you’ve lost the one person or thing you cared about most. Maybe you’ve seen things in this world that no one should have to see. Maybe you’ve been hurt in ways that no one should have to hurt. Hope knows where you have been and what you have been through. Hope has already seen every choice you’ve ever made, and Hope has been there beside you through it all. Hope will never leave you nor forsake you. Hope loves you. Yep there’s that word again? Love…well Hope loves you so very much that He gave up His life for you. Bet you didn’t know you had friends like that huh? Well you do. Hope is a friend who died for you so that you can continue on in just these times you are facing. Hope doesn’t want you to give up. Hope wants you to let Him help you. Through Hope the sins of the past can be washed away, and you can become a new creature. There’s more to who Hope is. As I stated earlier, Hope is the Way. The Way you are being offered is a direction towards healing and getting past your problems. Hope is assuring you there is a reason to live. There is a brighter tomorrow. Following Hope will lead you to all that you will ever need. The path Hope will lead you on is one that is eternal. Hope is the Way to salvation and redemption. Hope is the Truth. Truth sometimes hurts because we want someone who will tell us all the nice things we want to hear, but Truth tells us everything good and bad. Truth will never hurt you. Truth wants nothing but good things for you. Sometimes it’s easy to blame Truth for things that go wrong or happen. But that’s because you may not be getting the results you want or expect. I know right now it seems as if it would be easier to just quit forever, but since Hope is Truth, then I’m going to be truthful with you. It isn’t. The choice you make now is a lifetime choice. Either you take away something that isn’t yours to take, or you can give Hope a chance and let Hope help you find the Peace you deserve. And Last Hope is Life. Life that will bring you Hope forever. I know your thinking Life doesn’t sound too grand right now. But that’s because you are looking at Life through your eyes and not through the eyes of Hope. Life through the eyes of Hope is so very different. I want to share with you what Life through the eyes of Hope looks like. It looks like a butterfly sitting on a flower. It looks like a child running through a mud puddle. It looks like a beach lit by the rising sun. It looks like a heart filled with joy on a day when it rains nonstop. Life is what is awaiting you through the promises that Hope has given. Those promises include a new Heaven and Earth, no more tears, and most of all Eternity. This world is truly not our home; it is just a temporary stop on a journey that ends in Life. Hope is what sustains us in this world, as when we do get Home, everything we have hoped for will become ours. Won’t you continue on with Hope? Give Hope a chance? Hope really does have something good for you. Hope really wants to show you that tomorrow is a new day, and one that is filled with new beginnings. Won’t you come and see what Hope has to offer? Here you are. Coming to check out what Hope has to offer. I’m glad you have chosen to do so. Let’s continue shall we? Imagine yourself walking down a road. On the right side everything looks dark and dead, and on the left side everything looks bright and alive. Then ahead sits a mountain and the road split with a pathway to the right leading further into darkness. But, to the left is a sunlit pathway that looks so inviting and beautiful. Hope lives down the Lighted pathway. 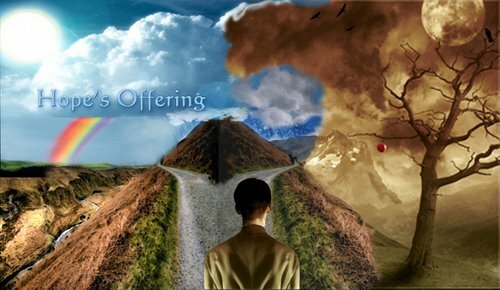 Hope is offering for you to join Him on that pathway. Are you wondering why Hope is offering anything to you? The answer is that He is doing so because He loves you. Uh huh? I know what you are thinking…there’s that love word again. But it is true. Hope does love you. In fact, Hope loves you so much that He is offering to help you, to heal you, and to give you a new start. And what is more, He is offering this to you at no cost. The price has already been paid in full. If your sitting there thinking that Hope wouldn’t be offering you anything if He knew the horrible things you have done, your wrong. Hope wants to help remove all the guilt and blame you may be feeling towards yourself regarding these past missteps. Hope is offering to cleanse you of the past forever. Hope wants to show you how to take the past and use it to help someone else, instead of you continuing to use your past to beat yourself up over and over again. Watching your life be torn all apart. Filled with Hope to cleanse the sinning. Hope wants to bring you into the fold. 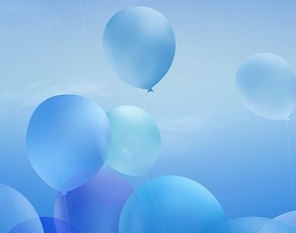 I know it’s been awhile since you’ve felt joy and happiness, but the feeling is still there. It’s just been suppressed inside of you. It’s been surrounded by all the emotions that have been controlling you. Hope is offering to help you find that joy and happiness. Hope can renew your life and help you see that there is a way. With Hope all things are possible. A new beginning waits for you. A chance to put all of the past behind and to start fresh. This includes everything you feel is a reason not to continue. But, Hope knows what is waiting for you, and wants you to come see. Starting over may seem scary but it’s truly better than the choices you have been contemplating. Hope will not hurt you. Hope will only serve you. You may be asking what will make a new beginning better than the old life you’ve been living. The answer to that is that Hope will be with you on this new journey. Have you ever had a pair of jeans that you liked so much that you wore them until they had holes in them? Then you patched the holes so that you could wear the jeans just a bit longer? Until one day those old jeans finally couldn’t withstand any more wear and they fell apart. Then you had to go out and purchase a new pair of jeans. This is similar to what Hope is offering to you. Hope has seen the wear and tear that you’ve been through. Hope has seen the toll your past has taken on you. Hope has seen how you have tried to patch up your life time and time again. Hope knows that you deserve a new beginning. Hope is now offering to make you a new creature in Him. 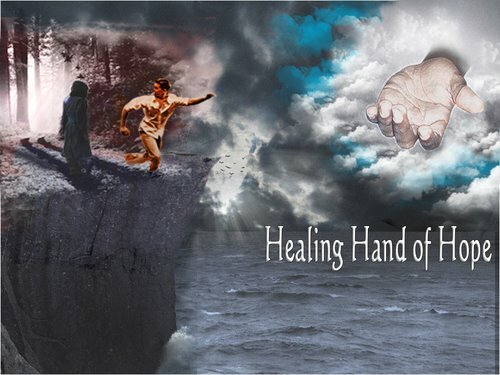 The Healing Hand of Hope has placed His offering before you. When we met a bit earlier, there seemed to be no way out, and you were about to give up. Hope has now shown you that there is another choice. Come let’s go together and see how to take that step. I can assure you the journey is about to begin not end. Won’t you take a step towards Hope? Now it’s time to take a Step towards Hope. With taking this step, you are about to enter a pathway to healing. Hope will be thrilled to know that you have decided to give Him a chance. The journey begins with just one small step. Sometimes those steps can be baby steps, but the key is to move forward. Often we think it would just be easier to stay where we are, but as long as we do that we are stuck in the past. Hope doesn’t live in the past, and He is awaiting you. Won’t you make the decision and take the step to come and join Him? Hope’s pathway is one that is filled with newness and Life. I know that’s hard to imagine sitting where you are at this moment, but it is true. The Helping Hand of Hope will bring you joy and happiness. He wants to give you the desires of your heart. He wants you to know that He does love you, and that He wants you to choose to follow Him. If your still not sure about taking the Step, then let me ask you a question. Why are you holding back? Are you afraid or unsure? Well that is darkness trying to keep you from moving forward, but there is no Hope in darkness, so taking one step is essential. Hope won’t force you, as He loves you too much to do that. But, Hope is offering you a way out of the valley. It’s your choice. This Hope Heals study on Hope Heals counseling with Hope Heals message and all of its Hope Heals contents are copyright protected and should not be reproduced, copied or sold in whole or in part without express written permission from Christianity Oasis and/or the author of Healing Hand of Hope.